Nothing says “Happy Valentine’s Day” better than chocolate, gold and flowers. With Julie Hinton’s chocolates, you have all three (the flowers are candied violets atop the chocolate at right). Photography by Evan Dempsey | THE NIBBLE. 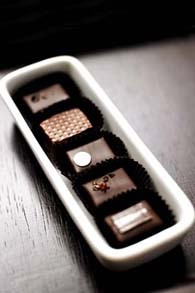 WHAT IT IS: Fine chocolates from small American artisan chocolatiers. WHY IT’S DIFFERENT: Everything is made in small batches from the finest ingredients by the on-premises chocolatier/owner. 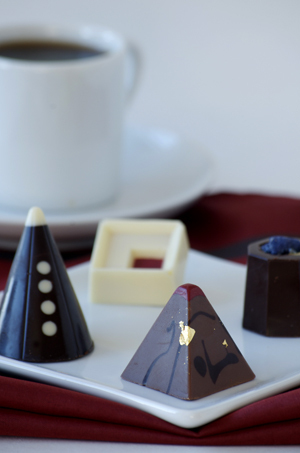 WHY WE LOVE IT: It’s exciting to discover new gifted chocolatiers to add to the ones we already adore. As the saying goes, “Add new chocolates but keep the old/One is silver and the other gold.” Plus, add new friends who like chocolate. CAPSULE REPORT: Valentine’s Day is coming. That means searching for the right chocolate gift. To NIBBLE readers, it may even mean tracking down what’s new and exciting in American artisan chocolate. Even in this cloudy economy, it seems that another fine chocolatier pops up each week. More than a few are leaving corporate America for second careers—and hopefully will be as successful as Joan Coukos of Chocolat Moderne, Mary Leonard of Chocolat Céleste and Kee Ling Tong of Kee’s Chocolates. Click on the individual links above or read the full review. Then, smack your lips, and consider buying something for any loved one who loves chocolate. Chokola’j. This Hamptons-based company uses organic and local ingredients and is committed to sustainability. The brownies, chocolate tablets and other goodies are equally delectable. See the review. Lillie Belle Farms. 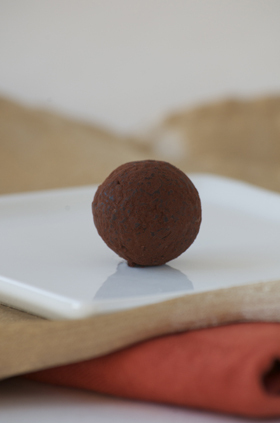 Chef Jeff Shepherd uses organic chocolate and organic fruit grown on his own farm. The fruit-filled bonbons are captivating—but so is everything else he makes. See the review. Theo Chocolate. The first organic, Fair Trade Certified chocolate made in the U.S. The company is named for Theobroma cacao, not for Vincent Van Gogh’s bro; but you’d almost cut off your ear for a box. See the review. truffles and bonbons we’ve ever had. —versus dressing your salad—start here. I admire their bravery as much as I stand in awe of their creativity. They’ve broken free of the corporate rat race and traveled their own path when everyone said they were crazy. 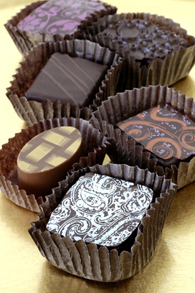 The chaos and complexities of owning a small chocolate business are almost beyond bearing. All these gifted chocolatiers want to do is stay in the kitchen and create something wonderful that will make even the most jaded connoisseur fall in love with chocolate all over again. Instead, they have to worry about production, marketing and public relations. People can’t buy your chocolates if they’ve never heard of you. Then there are packaging woes: Will your new boxes arrive in time for the Valentine’s Day rush? And ingredients scares: Your supplier still hasn’t come through with that 66% couverture you need for your grapefruit caramel hearts. And ever-escalating costs to buy the finest ingredients. And the questionable reliability of any hired staff. And shipping: Will the chocolates arrive in perfect condition? And a few hundred other matters. All truffles are not created equal. You need the best chocolate and cocoa, the freshest cream and the finest flavors, like the fresh organic lime zest and organic lime oil in this Freshly Zested Lime truffle from Neo Cocoa. It’s a wonder that anyone sees a profit from his or her chocolate endeavors, or can stick to this painstaking and exhausting business for any length of time. But many do, and for that we are grateful: We get to enjoy fine chocolates ordered from artisans all over the country. I’ll be the first to tell you that I’m a tough critic. I try a lot of chocolates before I find companies good enough to recommend to NIBBLE readers. Not only do I require some spectacular sweets, but good service to boot. I hope you’ll choose to order from some of these chocolatiers, whom are more than worthy of your support. You’ll enjoy not just the chocolate, but the excitement of discovery. 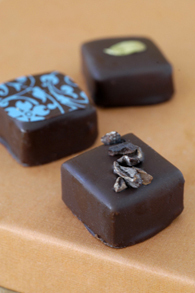 Visit Page 2 for the first of our four featured chocolatiers. Companies are listed in alphabetical order.